How do we achieve success on a consistent basis in the translations that we perform, day-in and day-out? At Language Innovations, quality control begins with your first communication with our company. Whether it is a phone call, email or a written request for proposal, a client representative will address your inquiry in real time, immediately establishing open lines of communication with you, which is the first essential step to ensure quality in the work we do on your behalf. As we progress through the quality control process, your dedicated representative will discuss the project at hand with you and gather the details of the work to gain a better understanding of your particular needs and requirements. As stated above, this immediate and open line of communication is critical in forming a mutual level of understanding between you and us. Your comfort and confidence in our services from the onset is paramount. The best customer service doesn’t really matter unless you have 100% confidence in the people doing the work. Language Innovations’s translators and editors are trained and experienced professionals with industry-specific knowledge and know-how. We bring on experts who love what they do and excel at their craft. Quality control is overseen and maintained in each and every step of your translation. 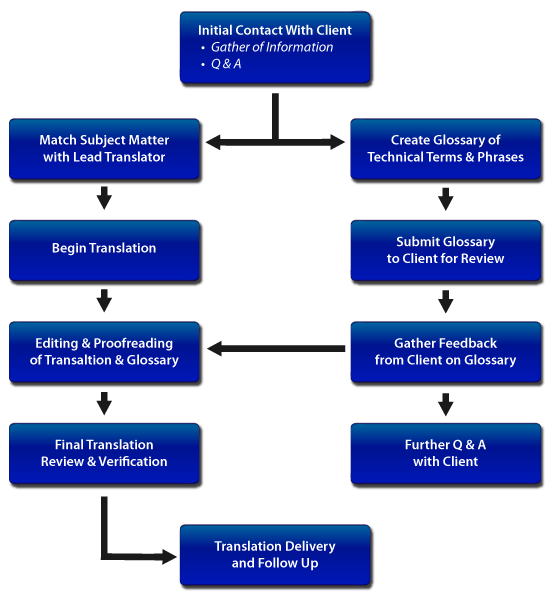 The following 10 Step QC workflow gives you a step-by-step reference of how we manage your translations. For more detailed information, please refer to the full description of our detailed Quality Control Process below the diagram. In processing your translation, we will have confirmed your requirements and specifications of the assignment. Next, we match the specific subject matter of the document to the appropriate lead translator. In other words, we put in place translators whose background and experience corresponds to the precise topic of your document. This ‘happy marriage’ of subject and translator is quite important in executing an accurate translation, both contextually and idiomatically. Next, during the translator’s review of the document, it is common to create a glossary of technical terms and phrases. The glossary contains specific language and phrasing from the original document and its corresponding translation. The glossary offers several benefits: First, it highlights the precise wording of the document which can then be reviewed, modified and edited throughout the translation process. Second, we can deliver the glossary to you at the onset of the translation for your review, modification and approval. As it is usual to have more than one accurate and acceptable way to translate language, the glossary gives you some insight into our translator’s thinking and methodology. You might have someone in-house or an end-user for example, who would review the glossary. The feedback you provide us is welcomed and can add to the translation process. Additionally, the glossary remains a living document and is updated over time with each subsequent translation. Third and finally, the glossary provides an invaluable benefit for assignments which require several translation teams working on different sections of the document in order to meet a short deadline. In this case, each translation team will incorporate the language in the glossary, thus guaranteeing consistency in the terminology. Once the document has been translated, the translator puts the translation ‘on the shelf’ for a period and thereafter reviews the translation once more with fresh eyes before it is sent on to the editor. At this stage, the translation is reviewed and edited by the assigned editor. If special formatting or desktop publishing is part of the project, we will have assigned the appropriate personnel to the job as well. The last steps in the process include verification that all instructions from the client have been followed as well as a follow up with you upon delivery of the translation. A note about our translators: The vast majority of our translators are accredited by the American Translator’s Association and also hold (advanced) degrees in translation/linguistics in addition to practical experience in specific fields, i.e., law, medicine, marketing, finance, education, international business, etc. Most importantly, a native speaker of the source language leads each translation to ensure a complete and accurate translation.